This graph shows the amount of time I spent on the different subjects and was made for my graduation presentation at Filmakademie. I found it interesting to give myself an overview of how much time I actually spent on each discipline. The measuring unit is "full time months" (20 days, 7 hours each). And it is normalized, so if I have done multiple disciplines at the same time I had to divide the time for each of them. My resume helped me to get a fairly accurate estimation. But of course my prior programming knowledge (B.Sc.) helped learning scripting and the Maya API faster. And most scripting was done for rigging, so they are connected quite heavily. Also it may be interesting to know how much time someone spent to get to the work done (productivity / efficiency?) 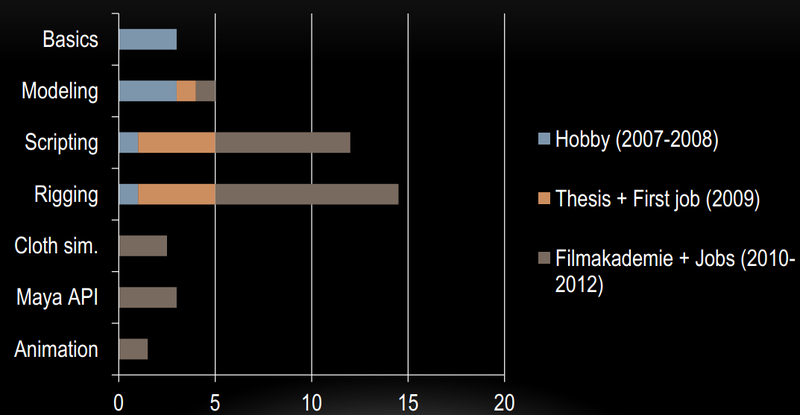 in the demoreel and the time spend to achieve the skill level (talent?). To predict costs and growth of the employer?